We love Dr Seuss! We have a full set of Dr Seuss books which have been a firm family favourite for many years. Her brother gave her this set when she was born and we have read them all over the past few years. One of our favourite books by Dr Seuss is Green Eggs and Ham and Peakles does like to join in with the rhyming words too! 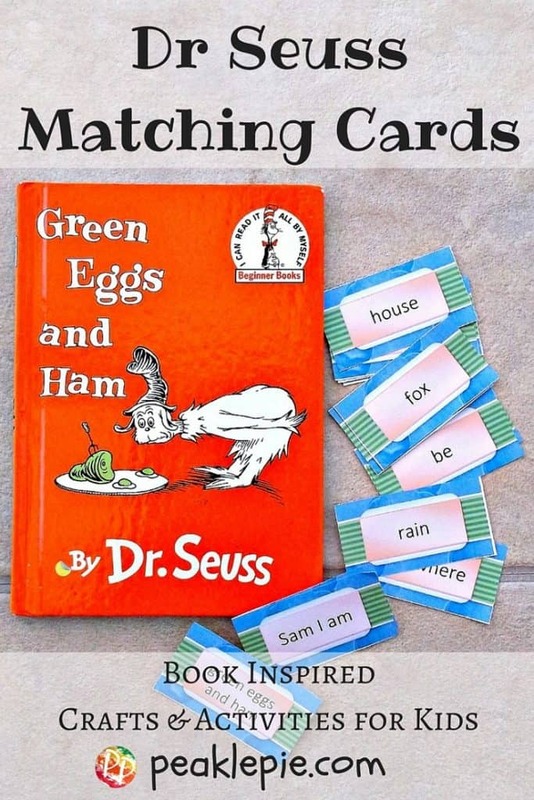 To help develop her understanding of rhyming words, and to start constructing her own poems, I created a set of Dr Seuss Word Matching Cards which you can download for free by clicking on the link: green eggs and ham matching cards – Print them off onto paper or card and cut them out to play some of these matching games. Remove the ‘anywhere’ and ‘be’ cards. Shuffle the rest of the cards and place them all face down. Take turns in turning over two cards, one at a time. If you get a rhyming pair then you keep those and have another turn. If they are not a rhyming pair then turn them back over and the next player has a go. The game finishes when all the cards have been matched and the winner is the person with the most matched pairs. Shuffle the cards. Either have one person turning the cards over for everyone or divide the cards between two players. The object is to turn the cards over and say the word printed on the card. When you get a rhyming pair such as ‘Fox’ and ‘Box’ shout “Green Eggs & Ham!” and you get all the cards under that rhyming pair. The game finishes when all the cards have been turned over and the winner is the person with the most cards. Take the matched pairs and encourage youngsters to create their own poems from the cards. Try ideas similar to green eggs and ham such as ‘blue cheese and yam’ or make up a totally different poem. Grab the book and read it together. When you read one of the words in the book featured on the matching cards, encourage your child to get the card and read it out as well as pointing it out it the book too! We hope you enjoy playing these games and reading the book too! 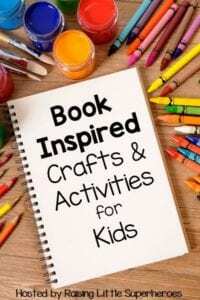 We are taking part in the Book Inspired Crafts and Activities for Kids series hosted by Raising Little Superheroes. Thank you – we really enjoyed taking part in the Book Inspired Blog Hop too! Dr. Seuss is one of our favorite children’s book authors. His books make reading fun for kids and I always love the rhyme scheme. Learning how to rhyme is such an important skill for kids to have as they begin to read.